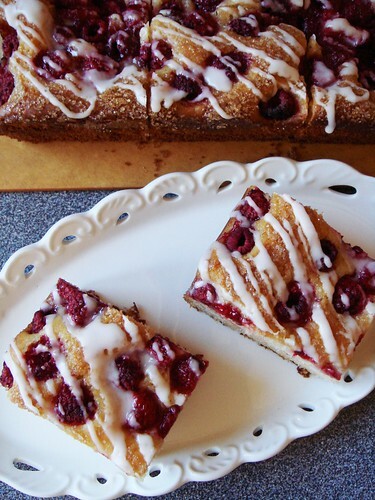 Interestingly, my usual sources yield only a handful of kuchen recipes. I think this is probably the result of French and American style dessert’s popularity in North America. 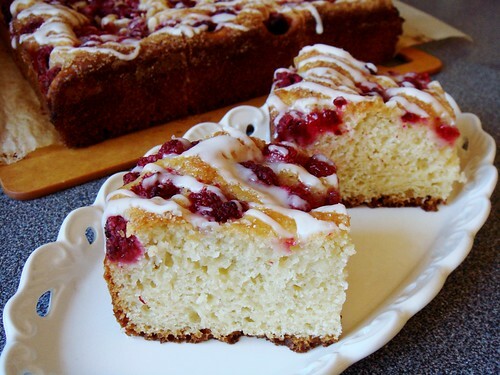 Serious Eats previously published Black Cherry & Raspberry Kuchen recipe from Seattle’s famed Grand Central Bakery. Authenticity aside, it perfectly fits my idea of a kuchen. Yeast-leavened cakes are distinctively different from ones made with baking powder, baking soda, creamed butter, or whipped eggs. I don’t consider them bready even though they share so much ingredient similarities with brioche. 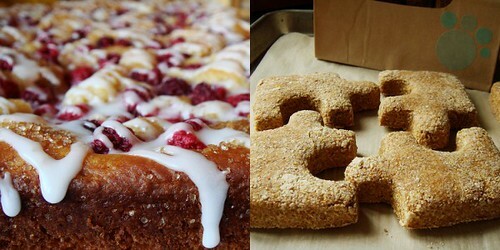 Think of a classic coffee cake braid and you know what I mean. Making this kuchen was amazingly easy, just a quick job of stir and wait. The yeast did the heavy lifting by turning thick batter to pillowy dough. The cake that emerged from the oven looked far too impressive for so little effort. It was tender and light as air. The jammy raspberries complemented so well with the crunch of sugar butter topping. The drizzle of lilting lemon icing added a touch of sweetness. I could eat it all day long. My other yeast-based cooking was frivolous but incredibly fun. My favourite dog is visiting Toronto for the month and we’ve been hanging out for a bit. Even after a whole year of absence, he still remembers me like yesterday! As soon as I rang the doorbell, he could not contain his excitement to greet me. Alright, I’ll stop my pet gushing now. I followed the dog biscuit recipe from Joanne Chang's Flour: Spectacular Recipes from Boston's Flour Bakery + Cafe. The trace amount of active dry yeast wasn’t even given the time or environment to leaven the dough. With a hearty mix of unbleached flour, red fife whole wheat flour, coarse cornmeal, bulgur, non-fat dry milk, chicken broth, and bacon dripping, these biscuits baked into something my favourite pup could not resist. 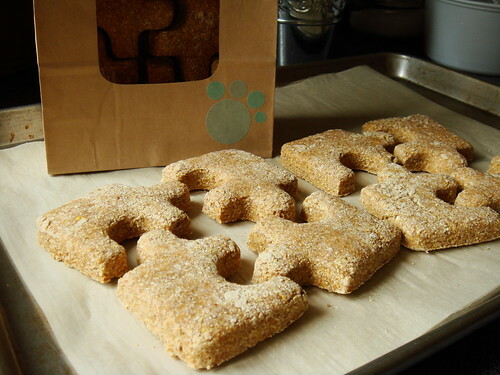 Just for fun, I shaped the biscuits into jigsaw puzzle pieces using my set of cookie cutter from Muji. Not that the puppy cares nor smart enough to figure out the puzzle. I got to play with yeast and puppy got to play with food. This is what I call a win-win situation. Momo gave us enthusiastic approval of the homemade dog biscuits.